After Collect Pond was buried, various legends arose. Legend 1: The pond supplied the city’s drinking water. It did not. However, the city’s subterranean springs, which were the source of the pond’s water, fed two other water supply systems. The Tea Water Pump southeast of the pond provided water from the 1740s until 1800, by which time it had become too polluted. In 1799, Aaron Burr’s Manhattan Company sunk wells just south of the pond and these provided water for 40 years, although of poor quality. New Yorkers drank from these sources, as well as hundreds of neighborhood wells, until the Croton Aqueduct, which carried pure water from Westchester, was completed in 1842. Legend 2: England’s future King William IV nearly drowned while skating on the pond in 1782. This was first reported in an 1869 biography; in fact, the prince had been pushed around the frozen pond on a blade-fitted chair without incident. 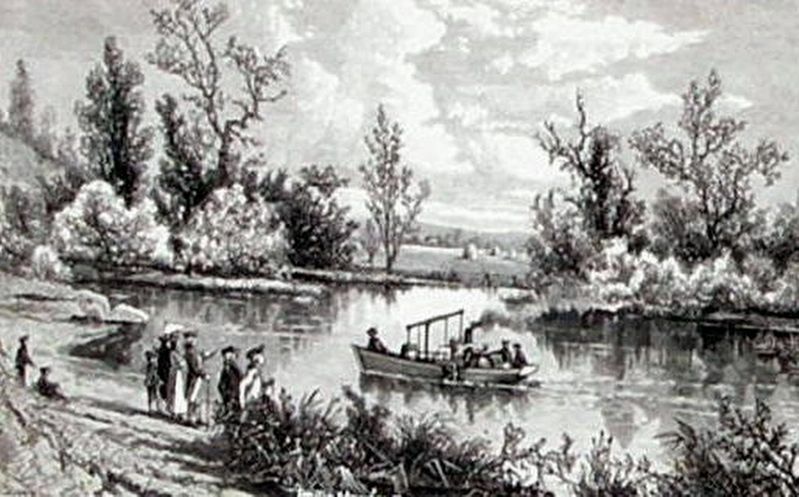 Legend 3: Steam pioneer John Fitch tested a steamboat on the pond in 1796. Location. 40° 42.978′ N, 74° 0.121′ W. Marker is in New York, New York, in New York County. Marker is on Lafayette Street near Leonard Street, on the right when traveling south. Touch for map. Marker is in this post office area: New York NY 10013, United States of America. Touch for directions. Other nearby markers. At least 8 other markers are within walking distance of this marker. From Collect Pond To Park (here, next to this marker); Death of the Collect Pond (here, next to this marker); Collect Pond and the City (here, next to this marker); Collect Pond Before The City (here, next to this marker); “The Tombs” – A Mausoleum for the Living (was within shouting distance of this marker but has been reported missing. ); Collect Pond Park (was within shouting distance of this marker but has been reported missing. ); Abraham De Peyster Statue (about 400 feet away, measured in a direct line); Engine Company 31 (about 400 feet away). Touch for a list and map of all markers in New York. 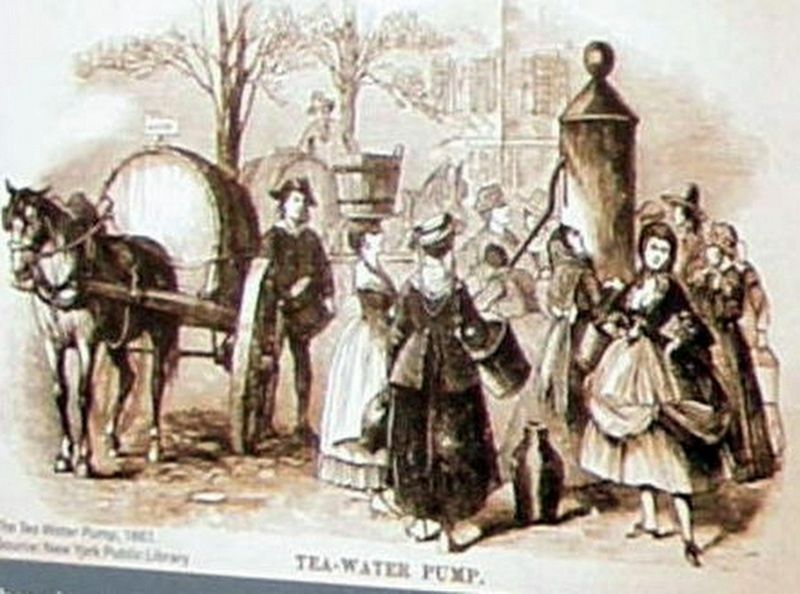 There in no contemporary image of the Tea Water Pump, but this late nineteenth-century depiction gives a sense of the pump’s importance to New Yorkers in the mid-to-late 1700s. The image of the Fitch steamboat test, created for an 1896 popular history of New York, is as fanciful as the event it supposedly depicts. More. 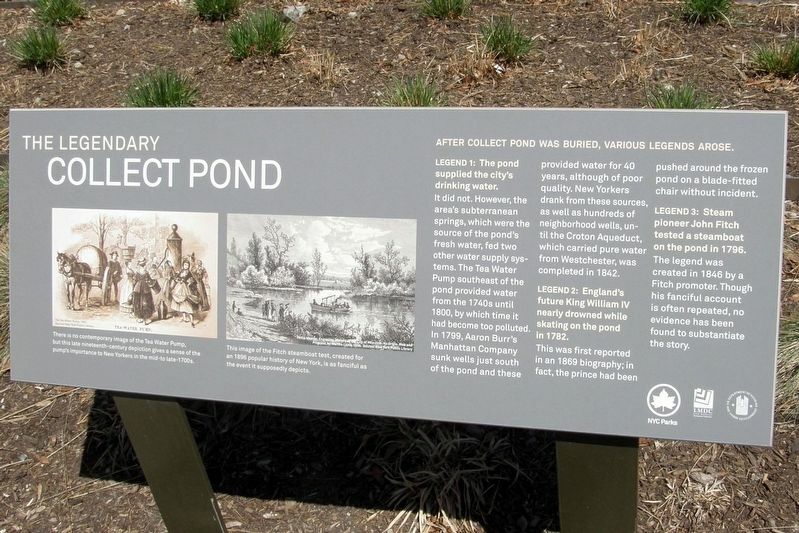 Search the internet for The Legendary Collect Pond. Credits. This page was last revised on April 8, 2019. This page originally submitted on April 6, 2019, by Larry Gertner of New York, New York. This page has been viewed 34 times since then. Photos: 1, 2, 3, 4. submitted on April 6, 2019, by Larry Gertner of New York, New York. • Bill Pfingsten was the editor who published this page.